The government of Pakistan is considering plans rebuild the Khyber Pass railway, reports the Express Tribune. Pakistan Railways’ chairperson Perveen Agha along with other senior officials visited the track on Thursday. “The purpose of the visit is to start work on reviving and restoring the Peshawar-Torkham railway track,” said an official of the political administration. The political administration has already given shopkeepers and other encroachers along the railway track to vacate Pakistan Railway’s property within a week so that restoration work can begin. 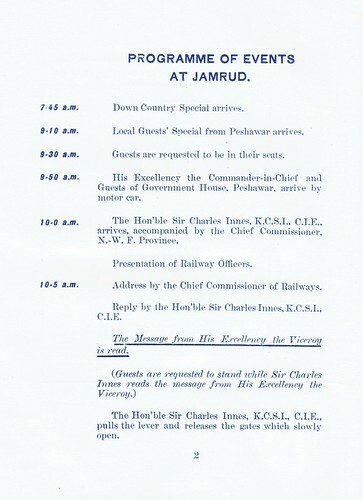 A railway has been opened through the Khyber Pass—a place of evil memory to British troops and a nightmare to India. The railway is 27 miles long from the entrance to the Pass to a valley near Londi Khotal. There are 32 tunnels, and the steepest gradient is one over 25. The old military problems of India and Afghanistan are now altered. The report says the government of Pakistan’s 2015-16 budget has allocated 620m rupees for a nine-month feability study, which would involve engineers from Pakistan and Afghanistan. NESpak, Mines Construction, Mine Hart, ILF (LIK), MMBP, Usmania Associates Karachi and “a company from China” have submitted tenders. Tracklaying could begun in 2017-18. The request for proposals was issued in March 2015. This is not the first time a railway to Jalalabad has been proposed, but so far railways have never crossed the border from the Khyber Pass into Afghanistan. Pakistan Railways issued an international request for proposals for a “Feasibility Study For New Rail Link Between Peshawar And Jalalabad Through Loi Shalman Valley” recently. I can’t track down exactly when it was issued, and the document is just dated “March, 2015”. The Loi Shilman valley (spelling varies) is in the loop of the Kabul River to the north of the Khyber Pass, while Jalalabad is the first major settlement in Afghanistan, on the route from the Khyber Pass to Kabul. The Loi Shilman valley seems to be a pretty remote and obscure area, which has a small internet footprint compared to the famous pass to the south (I’ve not even found decent maps). The consultants chosen will be required to propose at least three alternative corridors for the line, including the “existing Khyber railway alignment and the alignment through Lio-shalman valley etc”. 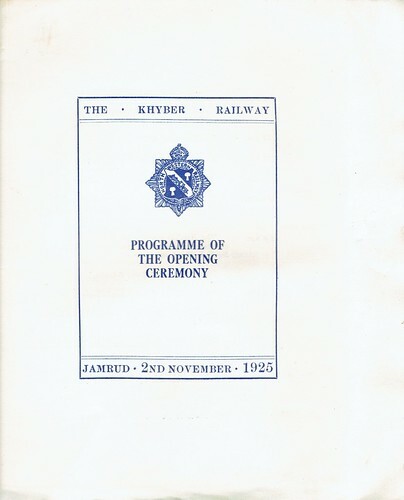 Using the existing Khyber Railway would presumably mean the line would not actually pass through the Loi Shilman valley, which is further north. The RFP documents can be downloaded from the Pakistan Railways website (if you can get it to work) or the Public Procurement Regulatory Authority website. Proposals were initially required by 14.00 on 31 March 2015, but following a “pre-proposal conference” on 17 March, an addendum was issued on 24 March extending the deadline to 15 April 2015, and extending the timescale from nine months to 10 months. Government of Pakistan has recently sanctioned PC-II for the feasibility study of construction of a new railway line from Peshawar to Jalalabad (Afghanistan). Pakistan Railway now intends to carry out this feasibility study in accordance with these Terms of Reference (TOR). Most of the Project area is located in hilly terrain and the study aims at selecting and designing most suitable alignment for providing the proposed rail link for a design speed of 100 km/h. A map of the Pakistan Railway Network indicating the Project area is place as Appendix-A of this Terms of Reference. The Consultant will carry out the feasibility study in accordance with the Pakistan Railway’s specifications, design parameters and schedule of dimensions etc. For this study, the areas where Pakistan Railways specifications/design parameters are either not available or need any revision / updation, the European Norms (EN) and UIC/AREA standards will be followed with the prior approval of the Employer. Afghanistan is a land-locked country and three gauges of railway track are in use in its neighboring countries; standard gauge (1435 mm) in Iran and China, broad gauge (1520 mm) in Central Asian States and broad gauge (1676 mm) in Pakistan. The Consultant shall propose the location (s) for change of gauge and arrangements for the trans-shipment at interchange points/stations. The study conducted by World Bank through HB Consultant Bangladesh may also be kept in view in this context while preparing the Feasibility Study Report. f. To determine the economic and financial viability of the project basing on – among other factors – the rail transportation demand determined at (a) above and the development/operating/maintenance costs estimated at (c) above. The RFP specifies a single track line suitable for 80 km/h freight and 100 km/h passenger trains, with diesel or electric traction. The line should be to either Pakistan’s 1676 mm broad gauge or to standard gauge (1435 mm, as used in China and Iran). It is hard to see what purpose would be served by using standard gauge for this particular line; even if the Chinese eventually build a standard gauge railway to the Mes Aynak copper mine, a break of gauge on this section would make little sense. 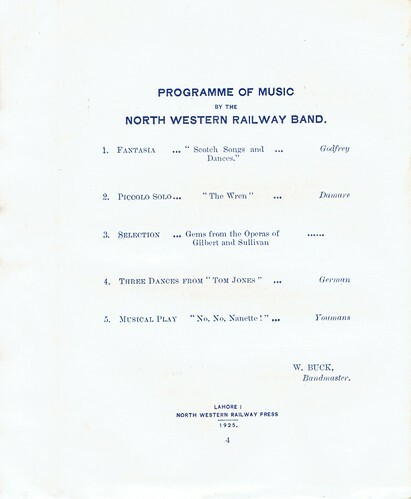 There have been been past proposals for a railway through the Loi Shilman valley, with the British authorities undertaking surveys and actually starting work in the early 20th century. Having rejected a route through the Khyber Pass, there were two options for a line from Peshawar to the Afghan frontier: one following the Kabul River gorge to an appropriate site for a terminus, and the other initially following the river route but then turning left and running up the Loi Shilman valley, with a significant tunnel needed to reach a suitable terminus on the side of the hills facing Afghanistan. Construction of the line was approved as far as the point where the two potential routes diverged, pending a final decision on the rest of the alignment, and work began. However the Anglo-Russian Convention of St Petersburg in 1907 reduced the threat which the British military authorities felt Russia might pose to the northern frontier of India, and the civilian authorities were getting concerned about the rapidly increasing cost of the project. As a result, work was halted. Maps of the various alignments which were considered can now be found in the British Library. 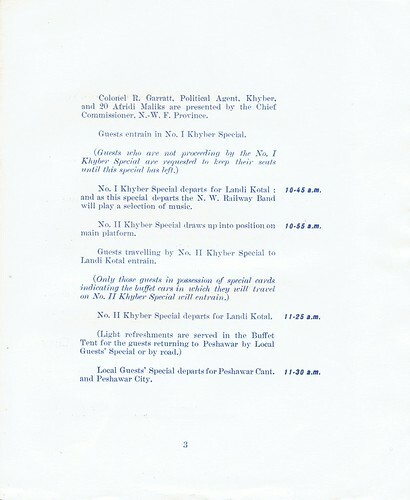 Further surveys subsequently showed that a railway through the Khyber Pass was feasible, and the construction of this line which opened in 1925 made the Kabul River or Loi Shilman lines unnecessary. 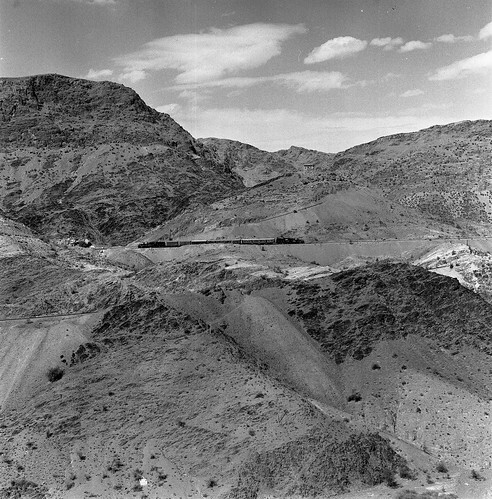 Although the Khyber Pass line never crossed into Afghanistan, preliminary studies were undertaken by the British for an possible extension to Dakka, the first suitable place for a major army camp, and from there to Jalalabad, as it was felt that the rapid construction of such a line could prove useful in the event of any future war with Afghanistan. The Khyber Pass railway survived, albeit moribund, until sections were destroyed by floods in 2006-09. This is a perhaps somewhat surprising idea for a brand new line, especially given the many problems which Pakistan Railways is currently reported to be facing on its existing network. While I cannot claim any knowledge of the area, I find it very hard to believe that anything other than a reinstatement of the out-of-use Khyber Pass line, perhaps combined with an extension to Jalalabad, could be even remotely viable. I wonder if in reality this is about reinstating the Khyber Line, and the Loi Shilman route is there purely to give something to compare it with, or as a legal technicality to show that some alternative options have at least been considered?